It seems that these are the only phrases the locals know. I can honestly say that this is more than I know in Burmese at this point. I found this questioning amusing after a while and would often play with people and respond with the same question, which would crack locals up laughing as they didn’t expect this – much fun and many laughs. A joke and smile always cracks the ice. 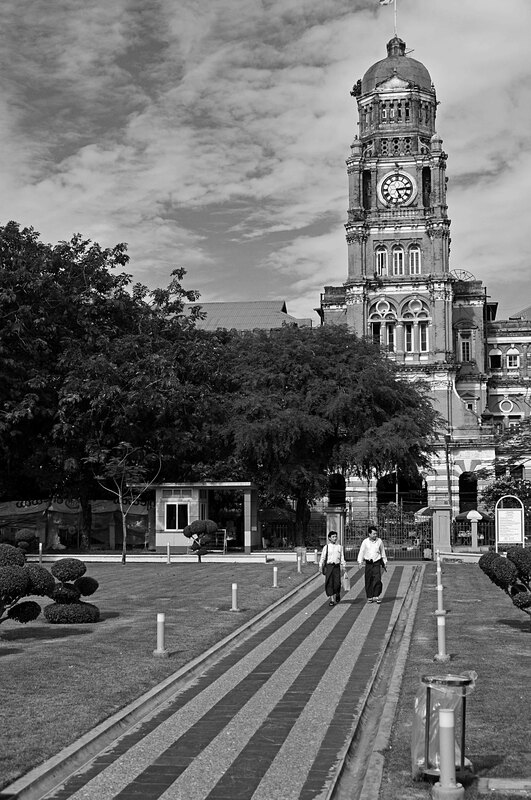 Flying AirAsia (USD$148 return) from Bangkok to Yangon was the only option. At the time of travel in July 2014, overland borders were closed, although you can obtain a 2-week stopover, which only allows travel in the close vicinity of your entry point. As we wanted the full 28-day visa to explore more of the country, then flying in is the only way to obtain this length of time. Although Burma was opened up more to tourism back in 2011, many areas are still closed, due to fighting. Tourists are not really free to travel everywhere. 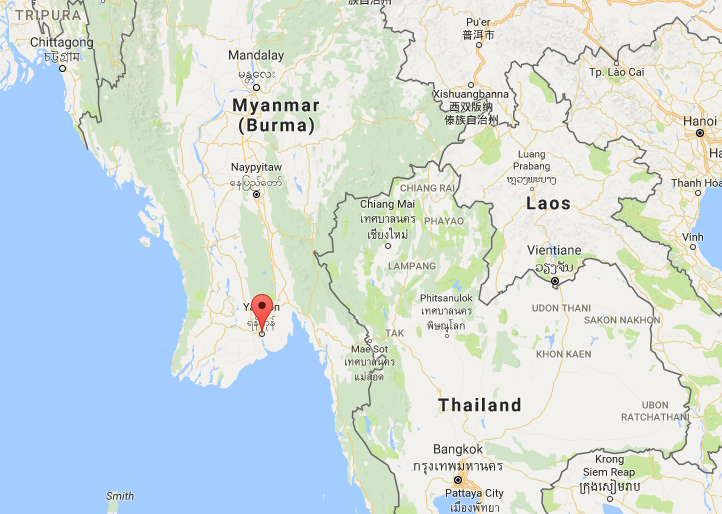 Take the 3-hour loop train at 14:25 from Yangon train station, which leaves from Platform 7 (200K – purchase ticket on the platform) – think this train leaves about 4 times per day, at 2-hour intervals. Whereas many of Yangon’s city streets are relatively clean (or at least there’s an effort towards ‘clean’), as you leave the station and beyond, the train backs onto poverty-stricken villages. For the better part of the 3-hour journey, you will experience a birds-eye view and just a tiny taste of how the 59 million Burmese (population of 60 million) living in poverty, subsist. The squalor that surrounds tiny and decrepit thatched wooden huts, which appear abandoned until a head peers out or a baby runs to the door, will affect even the most hardened of travellers. 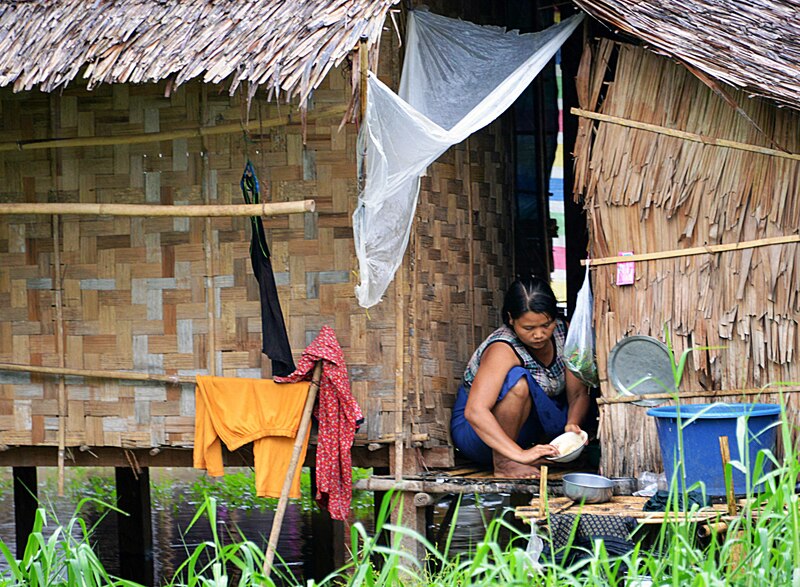 Some habitats are little less than a crudely thatched roof, no walls, and only plastic or a tarpaulin to keep the weather out. Don’t forget, Myanmar also has a wet season so subject to daily torrential rains, which is right now. 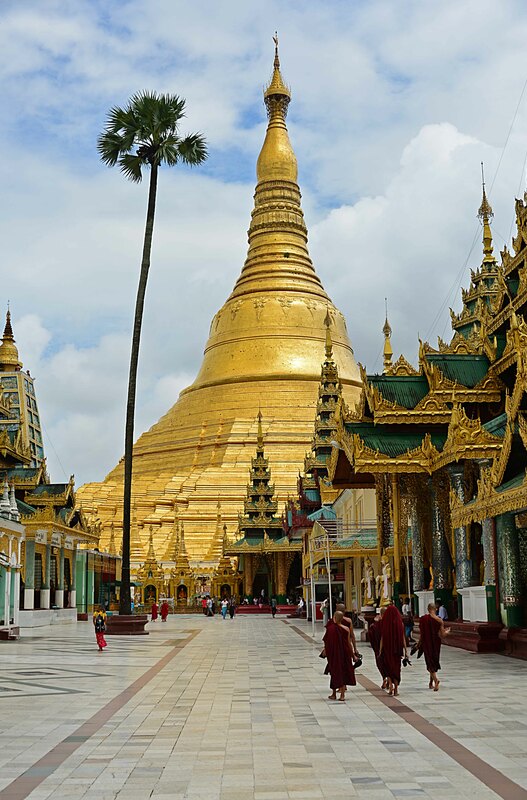 One of the most famous Pagodas in the world is Shwedagon and it’s not hard to see why. This spectacularly impressive Buddhist monument sits at 99-metres’ high, atop of Singuttara hill, which can be seen by day from most places of Yangon. By night, Shwedagon’s golden roof illuminates the city. Although documented proof does not exist, some believe the pagoda is 2,600 years’ old, which makes it the oldest pagoda in the world. Historians believe the Pagoda was built between the 6th and 10th centuries, by the Mon people. 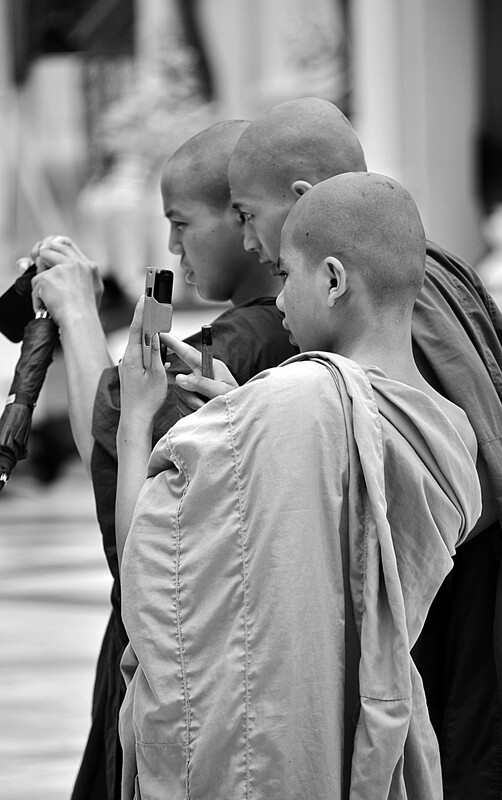 In Burma, Shwedagon is referred to as “The Crown of Burma.” When you visit, you’ll understand why. The main gold-plated dome is topped by a stupa containing over 7,000 diamonds, rubies, topaz, and sapphire. This display of opulence is offset by a massive emerald, which is positioned to reflect the last rays of the setting sun. You can’t help but be awe-inspired and also saddened, as it is a shame that just a small amount of this opulence isn’t spent on the locals, which are in dire need of most things. After Day 3 in Burma, my observations are that if you’re a tourist, Burma is expensive. There is a tourist price and a local price for everything. Depending on the service or attraction, the tourist price can be 10 times the local price. Sometimes it feels that the locals believe tourists are approaching dollar signs – they smile warmly whilst ripping you off. 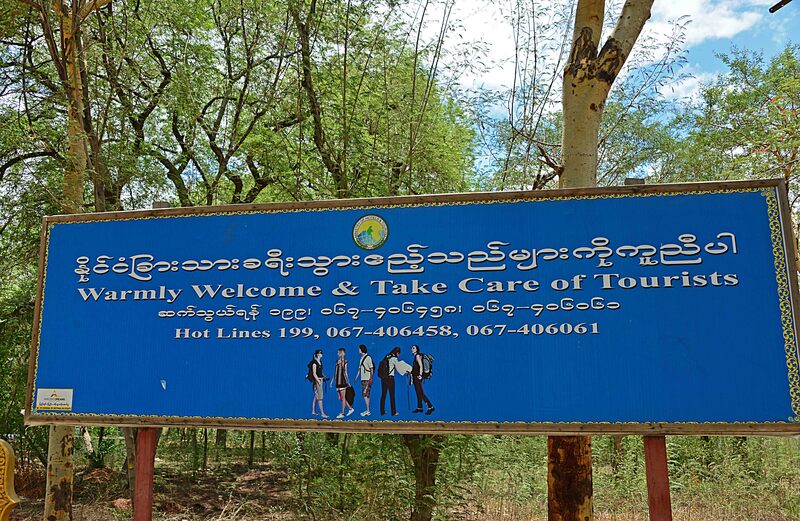 The government certainly does a good job of this…there are billboards everywhere stating “Look after our tourists and make them welcome” and “Warmly Welcome & Take Care of Tourists”. On the flip side, the government fleeces a tourist’s purse at every opportunity! Depending on who is telling the story, the money goes straight into the General’s pocket or to the dilapidated infrastructure in dire need of rebuilding. I haven’t seen much evidence of the dilapidated infrastructure being attended to yet and the extreme poverty suggests otherwise. Major sites display a “Foreigners only” gate and a “Locals only” gate, which is how foreigners are charged exorbitant entry fees and locals enter for free; it’s almost like an Apartheid. Don’t get me wrong, I don’t mind paying a fee, it’s just the amount – USD$10 to enter a Pagoda or USD$6+$2 camera fee to see the gilded balancing rock is a tad steep, especially on the falling Australian dollar. And if you’re on a budget or have been travelling for a while, then it becomes very expensive very quickly, and you decide whether to see the site or not. I don’t want to return home after only 3-months of travel. 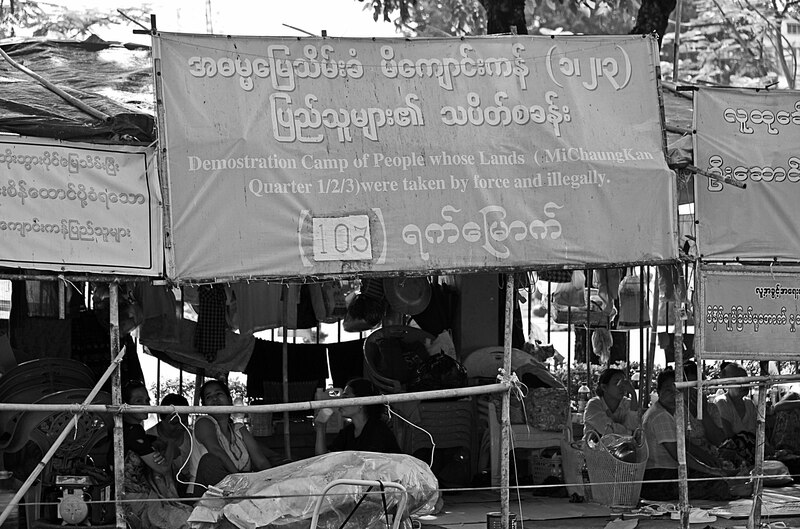 The saving grace is that you are only granted a 28-day visa for Burma. As a long-term traveller, doubt I could afford to stay longer. You can still eat cheaply here if you stick to the street hawkers, which are everywhere. 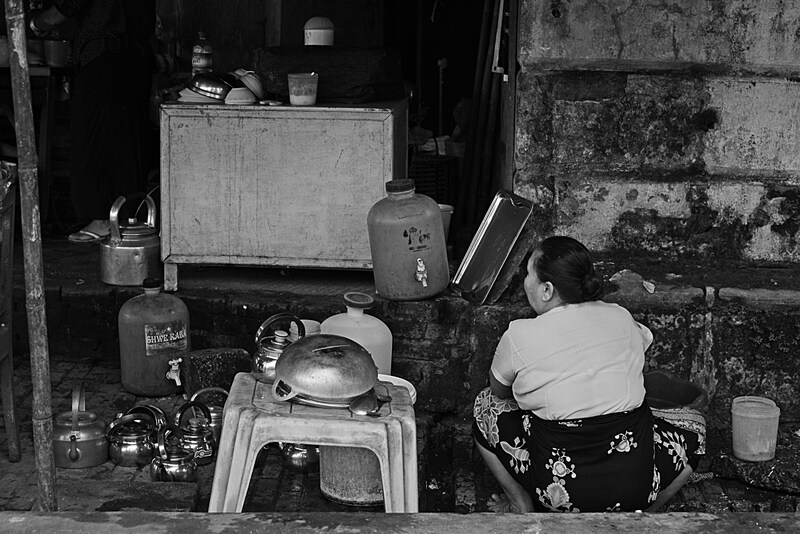 Like many parts of Asia, everyone is selling something on the street. Whether it’s 3 eggs in a tiny basket, small amounts of Durian (smelly fruit), a scattering of Rambutan, Samosas, spring rolls, or other local delights…there’s always something on sale. 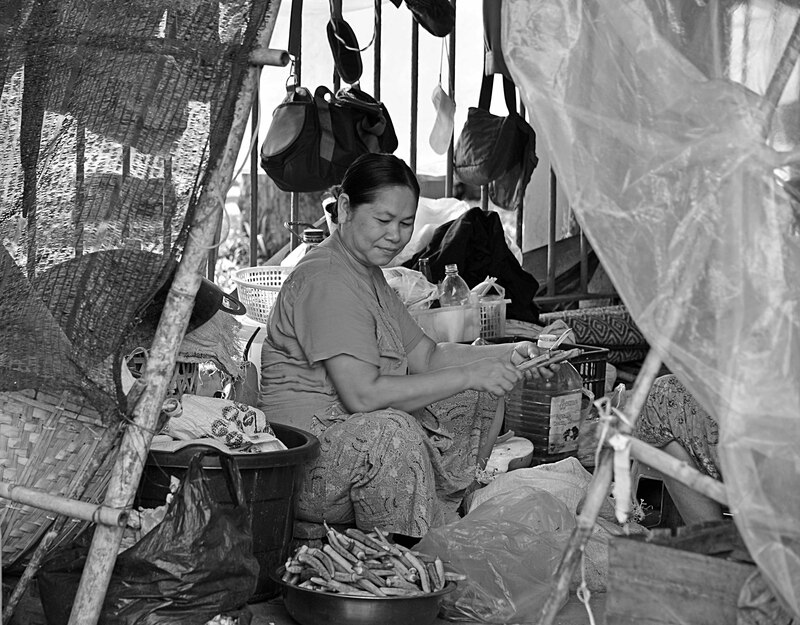 Everything is cooked up on the roadside or street amidst traffic exhaust fumes and chaos. 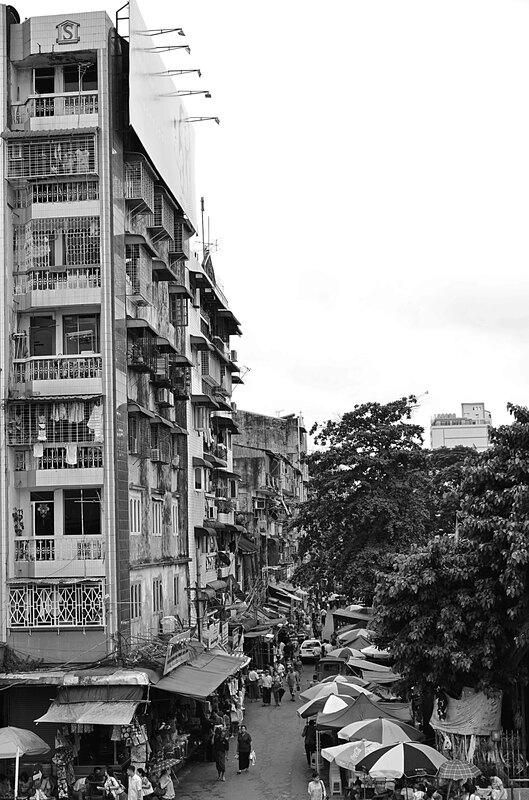 You notice many homeless people in Yangon and the poverty is quite confronting. This reminds me of the poverty I saw when I travelled in India for a month in 1985. There’s no shortage of children upwards of 2 years’ old running up to you with their hand stretched out asking: “moni, moni” – gut-wrenching. This market is known for its inner cobblestone streets and colonial architecture. The guide books sell this market as a major tourist destination. I’ve learnt that this statement typically signifies higher prices. Don’t expect too many bargains on available antiques, Burmese handicrafts, jewellery, clothing, and in the art galleries. If you feel the urge to buy jewellery or gems and have some spare cash lying around, talk to Daw May Win of the Nine Special Gems & Jewellery (A-40 East, Central Hall). Although I didn’t buy anything, Daw speaks perfect English and her prices are very good for gems and gold. Unlike many Government Certified vendors in this market, Daw owns her own shop and trades differently, and loves to talk to foreigners! Arrived late in Yangon on the first night, so didn’t venture too far from our ‘basic’ guest house. Only finding a local rowdy restaurant/bar close by, decided on a meal at this place. Staff running around everywhere. A noisy ambiance. Patrons making a clicking sound in their mouth to get the waiter’s attention, and most staff avoiding us as they don’t want the hassle of English-speaking foreigners. The waiter delivers the menu with excitement and is very helpful, which signified to me that perhaps not many tourists dine at this establishment. To my surprise, the menu is in Burmese with English subtitles. Ordering one “noodles, vegetables, and chicken” and one “rice, vegetables, and flesh”, the plates arrive piled-high with delicious unknown contents. Neither of us can place the taste of “flesh” or “chicken” in the meals. Anyway, we’re in the middle of eating the meal when a phlegm goblin decides to clear his lungs (thought he was going to lose one) and throat, then continued to spit on the restaurant floor right behind us. This was to become the first of many lung-clearing episodes in Burma! 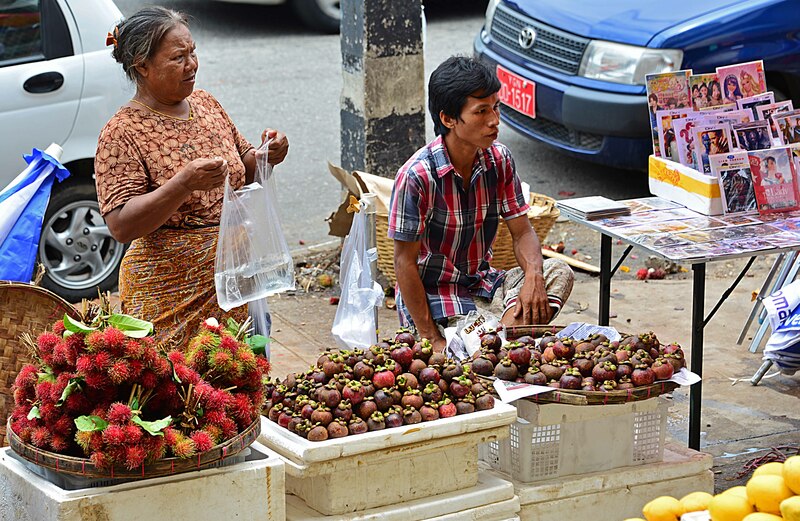 Locals (men and women) chew a lot of Betel Nut, which not only stains their teeth red, also creates much more mucous – so I’m told. The plethora of street vendors selling food is the most I’ve seen in any SE Asian country so far. Almost child-like tiny tables and stools are set up early each morning for breakfast. Some stalls stay the whole day and into the night, others just stay for breakfast, or lunch, or dinner. 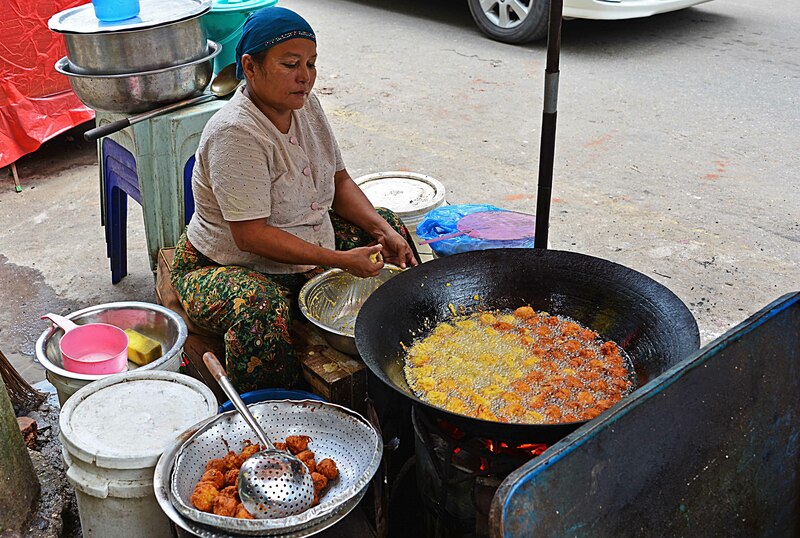 It seems that everyone in Yangon feasts at these tiny mobile stalls along the roadside. Amongst passing traffic, fish balls are fried. Typically, the stalls’ quality and price is exceptional. So, don’t pass these by as you’ll be missing out on varying arrays of delicious local delicacies. Try a stall along any walk in this city – you won’t be disappointed! No one in Burma accepts USD notes or local currency notes if they are creased, a little soiled in any way, with bent corners, slightest pen mark, logos scratched, or marked in any way; and any other excuse that can be invented on the spot! In other words, banks, money changers, and many stores only accept pristine crisp almost new notes. Although, there doesn’t seem to be an issue with locals dishing out crappy dirty notes, which is quite annoying. Each time someone gives you change, check your notes. Hand anything back that’s not in good condition…insist, otherwise, you’ll be left with a wad of useless local cash. I’m not sure why Burma is so bent on pristine notes of both currencies, does anyone know the reason for this? At the time of writing, all ATMs in Myanmar charge 20,000K for a 2,000,000K withdrawal, which is on top of what your local bank at home charges. Some banks limit withdrawals to 1,000,000K at one time, which earns the bank even more revenue. To help other travellers that may be reading this blog, leave me a comment below if you found a bank that does not charge for a withdrawal. These charges do add up whilst travelling and frankly, who wants to pay banks to make more billions in profit? I would rather spend this money with the local people. Myint Myat Guest House (No 30 / 40 Boykoke Street, Pazantaung Townships) – Friendly helpful staff but average accommodation and the first introduction to Burma’s service. Booked with Agoda and requested a quiet room on booking, but received a very noisy room as the window was fronting the communal, breakfast, and computer areas. The room was complete with a thin curtain, which only provided minimal blackout at night as the communal lights stay on until after midnight. Although this guest house advertises free wifi, this was non-existent as it’s the “rainy season”. There are 2 communal PCs but you have to wait for one to become free, sometimes for over an hour. However, staff will let you use the office PC, if required. Good breakfast of fresh coffee, toast, jam, butter (and also served a fried egg, 2 out of 3 mornings) is included in the room’s price. Travelling through Burma gives you the sensation of being swallowed up deeply into time, then spat out abruptly, 40 years in the past. Especially after travelling through Thailand, which presents such a stark difference between these two countries on almost all levels – some good, some not so good. Although the accommodation is expensive and below average in Burma, people are super friendly. There are still some places where a tourist is a novelty, especially with children, which is refreshing. 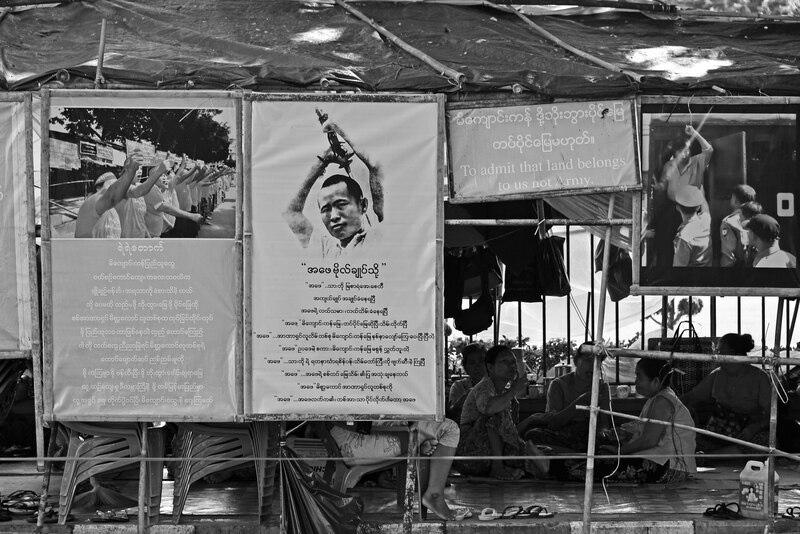 For now, it’s on to Mawlamyine by bus – George Orwell’s home for some time in the past. I believe this is not a well-traversed tourist destination, so hoping it’s not as busy as Yangon. Visit Nilla’s Photography for more images. 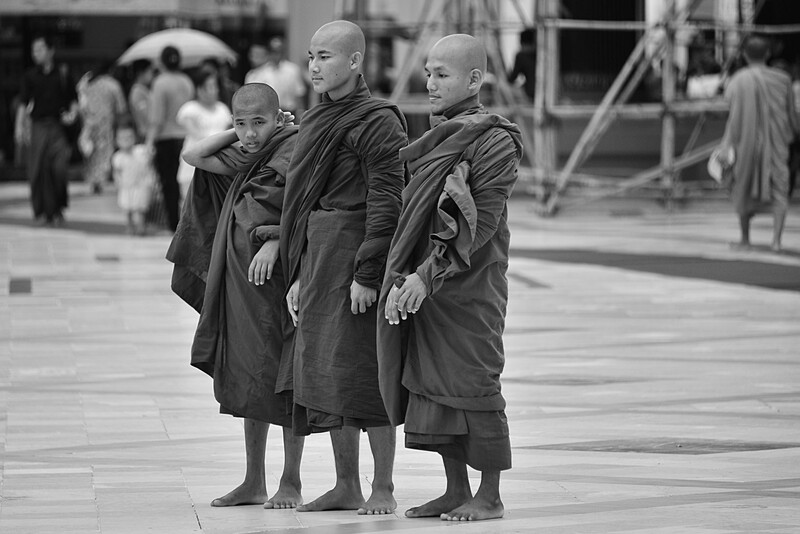 More blogs on Burma at Image Earth Travel. Wow, Nilla, this post was really educational. It would have definitely been a real eye-opener traveling throughout Burma. I can’t believe they won’t accept bent or creased notes from tourists though!! Sadly there is definitely a segregation between locals and tourists over there. Thank you and glad I can show people another side of travelling. Absolutely gorgeous! We are contemplating Burma as our next adventure (curiously, this is solely on the insistence of our three-and-a-half year old!) and this post gives me so many ideas! Hi Amelia, it’s a country of contrasts and one that tugs at the heart. I have more posts on Burma if you need some tips.